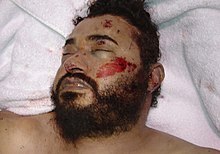 Abu Musab al-Zarqawi (October 30, 1966 - June 7, 2006) was the leader of the Iraq branch of al-Qaeda, a terrorist group in the Middle East. He was born in Zarqa, Jordan. He was killed by a bomb that was fired by the USAF into the house he was in at the time in Hibhib, Iraq. This page was last changed on 18 October 2017, at 13:04.